James Taylor, CEO of Decision Management Solutions, discusses how to focus on decisions to ensure the right problems get solved and what kind of analytic technologies can help achieve this. Organizations are increasingly adopting predictive analytics. 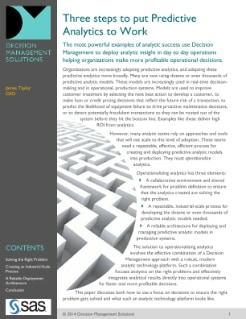 Many use thousands of analytic models each day in real-time decision making and in operational, production systems. However, many analytic teams rely on approaches and tools that do not scale to the level needed. These teams need a repeatable, efficient process for creating and deploying predictive analytic models into production. They must operationalize analytics. This paper discusses the three elements needed to operationalize analytics: a collaborative environment for problem definition, a repeatable, large-scale process for developing analytic models, and a reliable architecture for deploying and managing models in production systems.